In Southern Germany, a place that defines the tradition of brewing Lagers, Hefeweizen, the local name for the unfiltered wheat beers common in the area, are a bit of a throwback. A historical oddity that continues to thrive, they are a study in contrasts; hazy yet light, rich yet crisp, fruity yet spicy. This alchemy provides the secret to their success and makes them one of the greatest Summer beers of all time, and provided the inspiration for our Sömmerfest Weizen, brewed in collaboration with Springdale Beer. The fruity banana and spicy clove flavors which are the hallmark of these beers, comes entirely from the yeast. The balance of the flavors are determined by how you manage the fermentation. Too aggressive, the banana flavors overwhelm; too restrained, the beer falls flat. Collaboration beers are a great opportunity for brewing something new or out of the ordinary. Joel has been a long time fan of Hefes, and they were in regular rotation at his house in the Spring and Summer when he was homebrewing but it was a style we’ve never made at Foundation. Discovering that the crew at Springdale were also big fans of the style, put this at the top of our collab brainstorming list. The goal for Sömmerfest Weizen was to keep it simple, direct, and to let the flavors of the yeast shine. 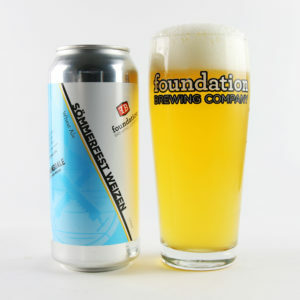 Sömmerfest Weizen is 19% wheat malt, 19% flaked wheat, the balance being Pilsner and Pale malt. For yeast, the critical component of this beer, we used a classic German Weizen yeast. Tettnang and Saaz hops were used for bittering and flavor at around 4oz per barrel. Initially fermented cool, then allowed to slowly rise in temperature over time, we struck the balance between fruitiness and spiciness that we were looking for. Hazy, light, rich, crisp, fruity, spicy, it is all there. We had a blast making this beer with our friends at Springdale, and hope you enjoy drinking it as much as we do. Prost!